I’ve been rather quiet about the observatory and astronomy in general in this blog for quite some time now. (Actually, looking back it was last June.) So, what’s been going on? When the weather has allowed I’ve been out a number of times, the most fruitful being around the end of October when Jupiter was close to opposition and hence the largest it can be. During this time the weather was helpfully quite good with a number of days of exceptionally stable air giving rather good viewing conditions (known as “seeing”). 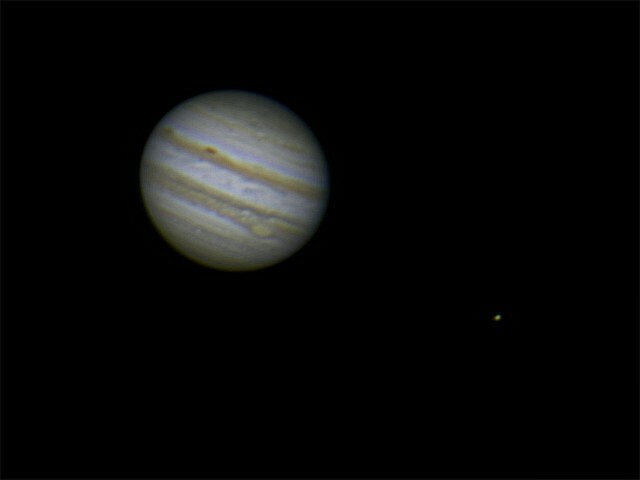 which gave me a good opportunity to try out a time-lapse video of Jupiter turning. Which does look rather impressive. Unfortunately, after that period the weather hasn’t been very kind and Jupiter has drifted further away from us as we journey around the Sun. Still, Mars is on its way! It could be better. The telescope mount wasn’t fully calibrated, I need a light pollution filter and the stars were twinkling wildly due to disturbed air. 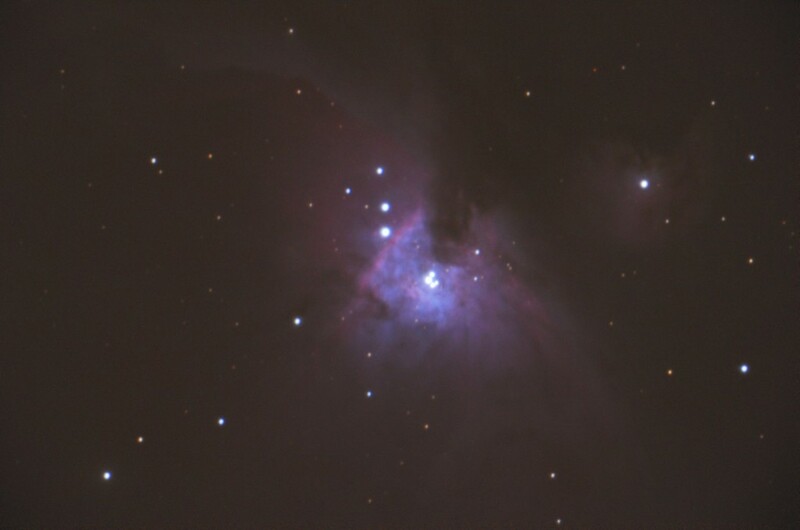 Still, it’s a start and far better than I could achieve with the Meade LX90. Most of my time in the observatory has been spent trying to find ways to stop water seeping in and causing mould to form. In the end I had to spray the whole of the outside of the base with a rubber sealant paint and drill some drain holes in the roof roller rails. These seem to have mitigated the problem but I’ll know better when there’s some more heavy rain. Other than that, the biggest news is the purchase of a new telescope with a “German” equatorial mount. The fact that the new optical tube is larger too is a side issue as the difference in price between the sizes wasn’t that great and so the biggest which would fit the observatory and the budget was the one I went for. The reason for the change was two-fold. Firstly, the Meade LX90′ mount is rather crude and wanders all over the place, making it useless for even medium length imaging of deep-sky objects. Secondly, the fork mount, when combined with an equatorial wedge, excludes much of the sky as the mount gets in the way of the camera. 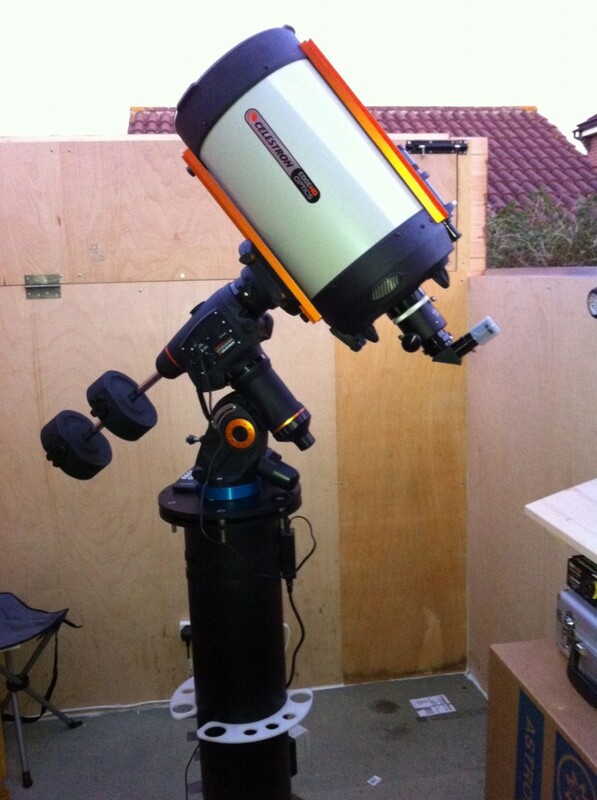 Anyway, in the end, after quite some extensive research I decided upon the Celestron EdgeHD 1100, 11″ scope. That, along with the hardware to fit it onto the observatory’s pedestal and guide scope, cost a pretty penny. It was only after I mounted it in the observatory that I found the one big problem with the guide scope (other than the weight) and that was that it won’t fit in the observatory. (In fact, the main scope only just fits when it’s at its easterly range of travel.) Still, other than that “Doh!” moment everything’s fine. The new ‘scope at home. Well, that brings things up to date really… More to do in the future.